This 1,690 square foot 3-bedroom, 3-bathroom penthouse condo sleeps eight and features vaulted ceilings, two master bedrooms and an upgraded kitchen. The oversized balcony offers up-close views of the ski slope so you can see skiers and snowboarders come down the mountain. Enjoy the luxury of this ski-in/ski-out complex. The entryway has mounted hooks and a bench for your convenience while coming and going throughout the day. The living area features vaulted ceilings and a beautiful, floor to ceiling, stone gas fireplace and a large flat screen TV. The sofa pulls out into a queen-sized bed. Additional sheets and blankets are in a closet. The private balcony can be accessed through the living area and offers stunning, up-close ski slope views. The full-sized kitchen is stocked with all the essential cookware and tableware to make a meal away from home and features slate floors, granite countertops and stainless steel appliances. The dining area comfortably seats eight around a gorgeous wood table and there are three additional seats at the breakfast bar. The first of three bathrooms is just down the hall and has a single sink vanity and a walk-in shower. This is also the location of the private washer and dryer. For your convenience detergent is provided. All bathrooms are stocked with towels and an initial supply of toiletries. There are two master bedrooms. Each have a king-sized bed with Ivory White Bedding, a flat screen TV and their own entrances to the balcony. One en suite bathroom features two separate vanities, a jetted tub and an oversized walk-in shower. The other features double sinks, a jetted tub and a walk-in shower. The guest bedroom has a queen-sized bed with Ivory White Bedding, a flat screen TV and an entrance to the balcony. 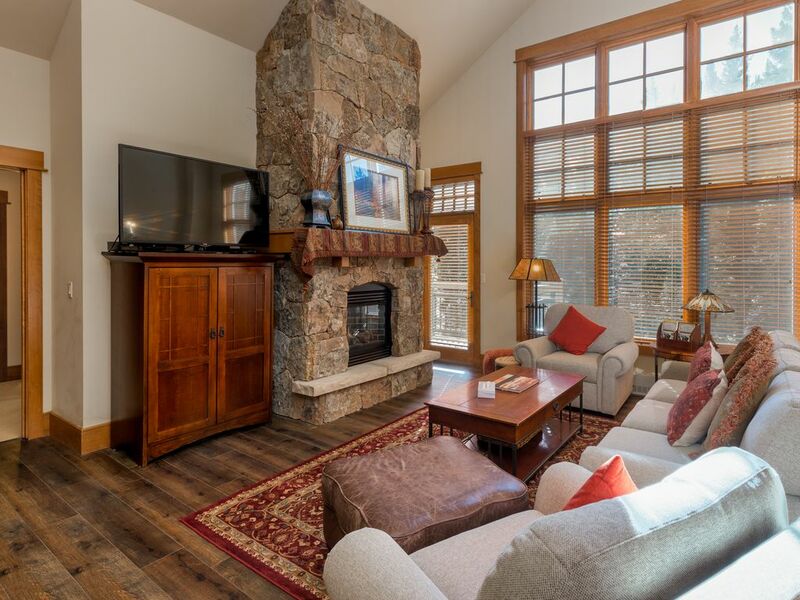 This property is professionally managed for the owner by Summit County Mountain Retreats. We are guest oriented, and we offer the following when you rent with us: hassle-free check-in and keycard pick-up, a generous supply of towels and an initial supply of consumables for your stay. We are also in the resort and have the longest business hours of any management company. VACATION RENTALS VS. HOTELS Booking a vacation rental is like staying at the house of a friend. In this vacation rental you will experience significantly more space, privacy, or comforts that feel like home, including a kitchen and a location that is beyond what most hotels can offer. All this at a significantly lower cost than a hotel with comparable features. These benefits bring different considerations than a hotel. More privacy means that most guests do not want daily housekeeping. We offer a check-out clean and, for an added fee, mid-stay cleans. We also offer a starter supply of some consumables, including coffee, paper towels, toilet paper and more, but these items are not restocked during a stay. A kitchen allows you to make home-cooked meals. Guests will likely visit the store to purchase groceries. Self-sufficiency is key to a happy stay in a vacation rental. We do provide housekeeping and 24/7 maintenance, but this is primarily for properties in between stays. Our staff services vacation rentals across several square miles, unlike a hotel that manages a single building. We have to strike a balance between cost and service, and have found that our current system has struck this balance. Our hope is that our guests understand the difference between booking a hotel and a vacation rental. Together we can provide affordable vacation rentals and happy stays for everyone! Lone Eagle is a true ski-in/ski-out complex and offer many amenities including an outdoor pool, hot tub and a covered patio with a fire pit that overlooks the main run. Plus, you're a short walk from the heart of River Run Village. The home itself has high-end finishes throughout, two master suites and private laundry. The private balcony features up-close ski slope views. Features high quality, stainless steel appliances! Beautiful place, great location and so easy to ski in and out and get something to eat or drink! Love love love the location! Prefect for what we were there for skiing! We've been coming to Keystone and staying at Lone Eagle for the last 7 years. This is another fine condo with great views. This ski-in ski-out unit with 3 bedrooms and 3 baths handle 8 people with ease. I would not recommend another condo on the mountain. The staff is phenomenal...always eager to help. The unit was just ok...terrible pillows for the beds, cheap TV sets, the hallway bathroom shower had to be repaired, and unless you put the thermostat to over 80 degrees in the main room, the far bedroom stayed cold. Putting a little money in to the unit to fix those things would go a long way! The elevator in the building may be the slowest in the world. When paying top dollar, you expect everything to be top notch. Lone Eagle is top dollar in Keystone...having guests deal with that elevator is unacceptable...even if what you are really paying for is the convenience of ski-in, ski-out. Location is great. Condo was roomy and nicely appointed. Some of the appliances and shower hardware is used and breaking. Elevator is extremely slow and this room is on the top floor. On the day of check out the elevator broke and we had to bring all our gear and luggage up and down 5 flights! The room charges top dollar so this was dissapointing. Great vacation with family! Elevators were out 3 of the 5 days we were there! Really stunk when we had to carry groceries up 5 flights of stairs!! Lone Eagle is one of the premier buildings in Keystone. You can enjoy the true ski-in/ski-out experience when you stay here.